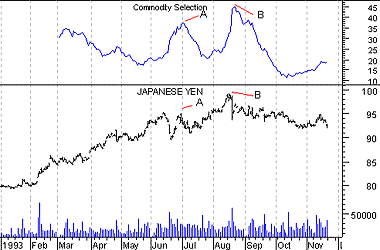 The Commodity Selection Index (“CSI”) is a momentum indicator. It was developed by Welles Wilder and is presented in his book New Concepts in Technical Trading Systems. The name of the index reflects its primary purpose. That is, to help select commodities suitable for short-term trading. A high CSI rating indicates that the commodity has strong trending and volatility characteristics. The trending characteristics are brought out by the Directional Movement factor in the calculation–the volatility characteristic by the Average True Range factor. Wilder’s approach is to trade commodities with high CSI values (relative to other commodities). Because these commodities are highly volatile, they have the potential to make the “most money in the shortest period of time.” High CSI values imply trending characteristics which make it easier to trade the security. It is beyond the scope of this book to provide full calculation details on the Commodity Selection Index. It is calculated using the ADXR component of the Directional Movement indicator. Wilder’s book New Concepts in Technical Trading Systems contains detailed information on the calculation of the CSI.